How “Good” Was Your Dinner Last Night? Learn how you can serve yourself—and your family—fully nutritious meals 365 days a year. You are invited to read—risk-free—a new report that puts the preventive and health-giving powers of good food in your hands. Discover the “secret ingredients” of a truly healthy and balanced diet. “What are we going to eat?” It’s a question you ask three times a day—more than a thousand times a year. It’s a question you may get tired of asking. But, as a health-conscious adult, you know the importance of choosing the right foods…foods that can fortify your body, boost your immunity, and decrease your risk of serious illness. Now a brand-new book from the editors of Environmental Nutrition, one of the most trusted and practical nutrition advisories in America, brings you authoritative answers for that daily question. Superfoods provides the essential information you need to consistently and confidently make the most healthful food choices. Superfoods will show you how easy it is to supercharge your diet with foods that are bursting with nutrients…foods that bring new variety to your dinner table…foods that are neither exotic nor expensive…foods that can protect your health and bolster your energy. Why settle for good nutrition, when you can have great? You know that “you are what you eat” is more than a slogan from the Sixties. You know that the right foods in the right amounts can keep your mind and body functioning at their peak. You know that you want to make calories count. You want to avoid artery-clogging fats. You want your diet to include the right amount of minerals and vitamins. You want your food to be wholesome, safe, and delicious too. Superfoods is the complete consumer’s guide to smart food choices. You’ll read about those foods that are proven to reduce the risks of heart disease and stroke. You’ll find out which carbs are good and which are bad—and why. What’s in your grocery cart? Before you go to the supermarket again, you’ll want Superfoods’ Nutrient- Rich Fresh Shopping List that identifies ingredients to add to your weekly shopping trip, considering what’s available during the seasons. You’ll be briefed on where to spend your “organic” dollar. Do you have trouble digesting dairy? You’ll discover non-dairy foods that are good sources of calcium. Discover the many forms and varieties of whole wheat, all of which can be healthful additions to your diet…learn the benefits of dark chocolate, which may also improve heart health….and find out the fish picks that are highest in heart-and brain-healthy omega-3 fatty acids. Your plate is no place for confusion. Did you know that a banner on the label proclaiming “zero trans fat” does not necessarily mean the product contains no trans fats? Or that there is little regulation on the word “natural?” Superfoods will tell you how to confirm that there are no trans fats…Why rice eaters have higher-quality diets… how cranberries can benefit your health year-round…and how olive oil is linked with lower risk of heart disease. Supercharge your diet with foods that are bursting with nutrients! 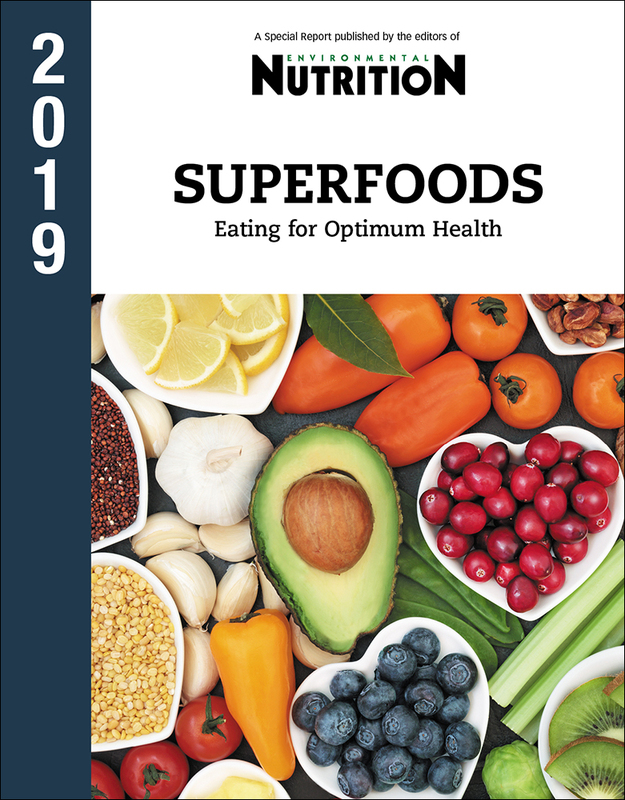 Get the authoritative 2019 report Superfoods from Environmental Nutrition. Eat for optimum health with all the taste and variety while cutting the fat, empty calories and your disease risk. Superfoods is packed with specific recommendations and take-to-the-store guides that will speed your shopping and expand your choices. You’ll get serving sizes for all of the food groups to help you avoid “portion distortion”, for sneaking more fruits and veggies into your family’s diet, plus a roster of foods that are richest in beneficial unsaturated fats, the pros and cons of drinking red wine. And you’ll discover some surprises. Do you know which plant foods are great sources of protein, along with fiber, antioxidants, and a host of other nutrients? Beans! Or that drinking coffee and tea have both been linked with health benefits? Superfoods will reveal how research indicates that the habit of including almonds in your diet may help you control your weight…the shelf-stable ingredients to keep on hand at all times…how a plant based diet may help you live longer…and the herbs and spices that have received special attention for their health attributes. The 2019 Edition is available to you now! Superfoods: The 2019 Special Report is available now at the lowest price ever! A very small price for information that can impact your health in so many ways. After you receive the book, review and learn from it. If, within 30 days, you are not 100% satisfied with the information in the report, call, write or email us and we’ll gladly refund you your full payment. And to ensure that you stay on top of important findings as nutritionists and researchers continue to study foods and how they impact our health, we will reserve future annual editions for you on a priority basis and at our lowest price. We will notify you by postcard or email before the next edition is released and shipped to you. If you don’t wish to receive it, just return the card within 30 days. You will also be able to review each future issue before deciding to keep it.